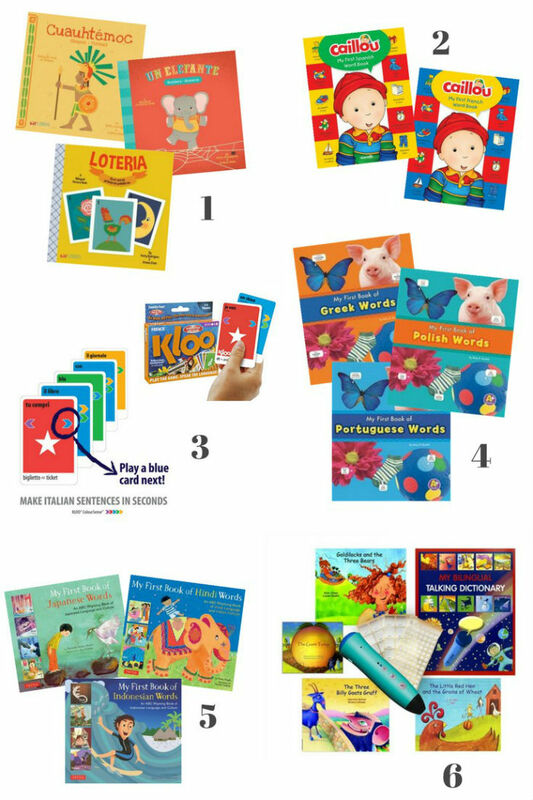 1 ~ Lil' Libros - These books are a great resource for Spanish language learning. Each book has both English and Spanish translations, and incorporates the learning of elements such as numbers and shapes into cultural stories. 2 ~ Caillou Spanish and French Books - When introducing a new language, it is sometimes best to use a familiar element so that children won't feel as overwhelemed, and may be more eager to engage with the new information. As such, these Caillou books are a great learning tool for little Caillou fans! 4 ~ My First Book of ... - These picture books offer a great overview of first words in a foreign language. Offered in a multitude of languages, these books are a great resource if wanting to create a multicultural library for your children! 5 ~ Tuttle Publishing - The first phrase that pops up on Tuttle Publishing's website is, "bridging the East and the West." That concept is clear through their collection of books aimed at teaching the languages of Asia. These books use the familiar A-B-C structure of the English language to outline new words in a variety of Asian languages. What's more, they include cultural and linguistic notes to help with the language learning experience. 6 ~ PENpal Audio Recorder Pen - This award-winning language learning tool allows children an alternative "reading" method, by enabling them to listen to content in a variety of languages by simply touching the pen to the book or other language learning resource. What's more, there are numerous free audio files available, allowing for a multitude of continued learning! Plus, the recordable feature allows learners to record their language learning and listen to their progress.